Weight bearing as tolerated in full extension with brace for 4 weeks post-operatively. Patients are cleared to drive once they are off all narcotic pain medications typically around week 2, or if cleared by Physical Therapist. Can unlock brace while in car. Regular manual treatment should be conducted to decrease the incidence of fibrosis. Regular stretching of the posterior musculature is important to prevent a flexion contracture. Although ambulating in full extension, some loss of motion prior to surgery is not uncommon. Imperative to work on recruiting VMO throughout the rehab process. No resisted leg extension machines (isotonic or isokinetic) at any point. No patella mobs for 4 weeks. Low impact activities for 3 months post-operatively. Use of the CPM (Continuous passive machine) for 6 hours a day for 4 weeks. Range of motion is 0-100 degrees for the first 4 weeks. Gradually work up to 100 degrees as patient tolerates. Avoid direct palpation of the surgical portals for 4 weeks. Consider the edges of the bandages as the “do not touch” zone (approximately 2” in all directions from each portal). Icing and elevation regularly per icing protocol. Continuous passive machine (CPM) at home for 6 hours daily during wake hours. Soft tissue mobilization (STM) to quadriceps, posterior musculature, suprapatellar pouch, popliteal fossa, ITB (iliotibial band), Hoffa’s fat pads. No patellar mobs x 4 weeks. No direct palpation of surgical portals x 4 weeks. Well-leg stationary cycling, upper body ergometer (UBE). Straight leg raises (standing, supine, side lying), quadriceps/ gluteal sets, hip and ankle exercises. Seated dangle with opposite leg support within appropriate range of motion. Passive range of motion 0 to 70 degrees. Gait weight bearing as tolerated in full extension brace x4 weeks post op. Nurse visit at 14 days for suture removal and check-up. Continue with soft tissue mobilization to quad, posterior musculature, suprapatellar pouch, popliteal fossa, ITB, Hoffa’s fat pads. No patellar mobs x4 weeks. No direct palpation of surgical portals x4 weeks. Non weightbearing aerobic exercises (i.e. unilateral cycling, UBE, single leg row machine). Manual resisted proprioceptive neuromuscular facilitation patterns of the foot, ankle and hip. Passive range of motion 0 to 100 degrees. Gait weight bearing as tolerated in full extension brace x4 weeks. M.D. visit at 4 weeks post-operative, wean off use of rehab brace. Continue with soft tissue mobilization to quadriceps, posterior musculature, suprapatellar pouch, popliteal fossa, ITB , Hoffa’s fat pads. Can initiate gentle patellar mobilizations and scar mobilization if incisions closed > 4 weeks post op. Incorporate functional exercises (i.e. short arc squats, slider lunges, shuttle squats/Pilates board squats and exercises, calf raises). Balance/proprioception exercices. Progress into bilateral stationary cycling and continue to add light resistance as tolerated. Slow to rapid walking on treadmill (preferably a low-impact treadmill). Pool/deep water workouts once surgical portals are completely closed. Gait: full weight bearing, unlock brace/wean off brace, focus good mechanics with minimal assistive device. Continue with soft tissue mobilization and scar tissue mobilization as needed. Bilateral stationary cycling and progress to road cycling on flat roads. Gradually increase the range of motion of closed- and open-chain exercises. Add lateral training exercises (i.e. side-stepping, Theraband resisted sidesteps) once adequate strength has been demonstrated. Patients should be walking without a limp. Range of motion 0 to 120 degrees. Ascend stair step at 8 inch height. Increase the intensity of functional exercises (i.e. add stretch cord for resistance, increase weight with weight lifting machines for upper body, avoid loading with knee flexion type activities- weighted squats). Road cycling as tolerated, remain in saddle, slow cadence, no clip in type shoes until > 12 weeks. Full range of motion symmetrical to opposite lower extremity. Descend stair step at 8 inch height, descend hills with good control. 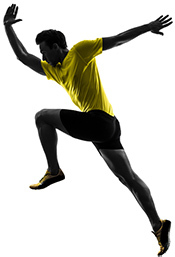 Continue with strengthening, endurance, balance, and sport specific training. Increase intensity of low impact type cardio- swimming, cycling, elliptical,etc. No high impact activities until 1 year unless approved by MD. Appointment with MD. Will receive further instructions at this time.